To stay ahead of the competition in online search you can’t just copy the market leader in your industry. You have to plan ahead and prepare your website for future algorithm changes. There’s no guarantee a website ranking number one for a specific keyword today will have the same rankings tomorrow. Here is a list of what RocketMill considers the most prominent SEO trends of 2018 and how your business should be preparing for them. The coveted ‘position 0’ in Google search, featured snippets have fundamentally changed the way users find answers to their queries in search. Google search results have long since moved away from the traditional 10 blue links to prominent answer boxes that take up valuable real estate. 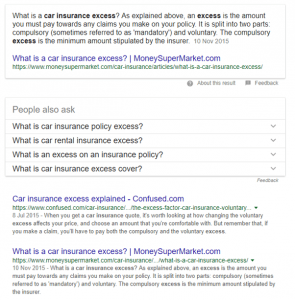 In this example for “what is car insurance excess?” we can see that, although Confused.com is ranking number one in traditional search, Google has decided to prominently display a featured snippet for MoneySuperMarket.com. This, coupled with the following ‘People Also Ask’ box, pushes Confused.com’s ranking much further down the results list. Winning a featured snippet can significantly increase organic traffic and click through rate in organic search. It’s especially useful for newer or lesser-known brands, as it allows them to potentially outrank big competitors in search. Well structured content in a question and answer format on a landing page is much more likely to trigger a featured snippet in search. The use of lists, tables and graphs can also assist with this. Featured snippets are seen as a core element of search to Google. This is reinforced by recent improvements to featured snippets which include more images and related search results. We regularly discuss the growing popularity of voice search and how it is here to stay. Whether it’s Siri, Cortana, Google Voice or Amazon Alexa, it’s no wonder increasingly more people are aware of voice search, as well as growing more comfortable using it. Whether it’s the best Italian restaurant to visit in a new city, or a question about a product or service, users are increasingly turning to voice search for quicker and more relevant results. Recently, Google has begun asking webmasters how voice search queries should be filtered in Search Console. As we approach 2018, voice search optimisation will increasingly become more actionable as data insights continue to grow. When it comes to setting up an SEO and content strategy, the rise of voice search has highlighted an increasing need to focus on long-tail keyword phrases that reflect the conversational tone of a user. 2018 is the year that brands should treat mobile as a top priority, instead of an afterthought. According to official statements, more than 50% of search queries globally now come from mobile devices but independent studies suggest that this figure is likely much higher (60% in 2016). If your website is still serving a mobile experience through a subdomain i.e. m.example.com and you’re planning to migrate to a mobile responsive design, Google recommends you do so before the mobile-first index rolls out. Taking this into account, Google understands its current algorithms are insufficient to rank mobile content, as rankings are determined by a review of the desktop content. To resolve this issue, Google has been experimenting with a mobile-first index for search. It is expected to arrive in early 2018. During production of this piece, on 18th December 2017, Google provided advice on getting your website ready for mobile first indexing. We therefore recommend that you get ready for it now. You will want to ensure that the mobile and desktop experience of your website is consistent across both platforms. It might work technically on a mobile device but is it actually usable? The Mobile-Friendly Test tool from Google can let you know if your site is mobile friendly. Starting on February 1st 2018, accelerated mobile pages (AMP) and canonical pages must match, or have close parity. The ‘current’ <link> tag to point to an AMP equivalent page is not necessarily preferred by Google if the AMP page is better. If your AMP pages fail to meet these requirements, Google will not rank these pages in the Top Stories section. When the AMP page does not provide critical content i.e. 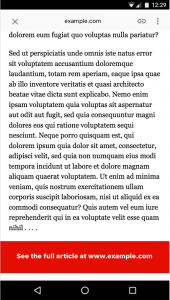 a teaser page, Google will notify the webmaster with a manual action message. Whether you call it link building, backlink outreach or building backlinks, just stop right there. Technical SEO has moved on from the dark days of private blog networks, directory submissions, spammy outreach emails and site-wide footer/widget links. Search engines can associate citations with a brand. A Google patent for Panda strongly suggests that this a factor taken into account by Google search. Brand building is a long-term strategy that focuses on building high-quality editorial content that is technically sound and targeting the right audience. Rather than connecting with bloggers or businesses for the prospect of a link, the opportunity to build brand awareness and encourage highly relevant referral traffic should be the primary concern. SEO trends for 2018 reconfirm that users must be at the core of our marketing decisions. The content on your website must focus on user intent and deliver an incredible experience on a mobile, tablet or desktop device. Structured data will help search engines understand your content and display to users in a presentable format. Finally, the focus on brand awareness over link building is a long-term strategy for website visibility in organic search.